Good and affordable? 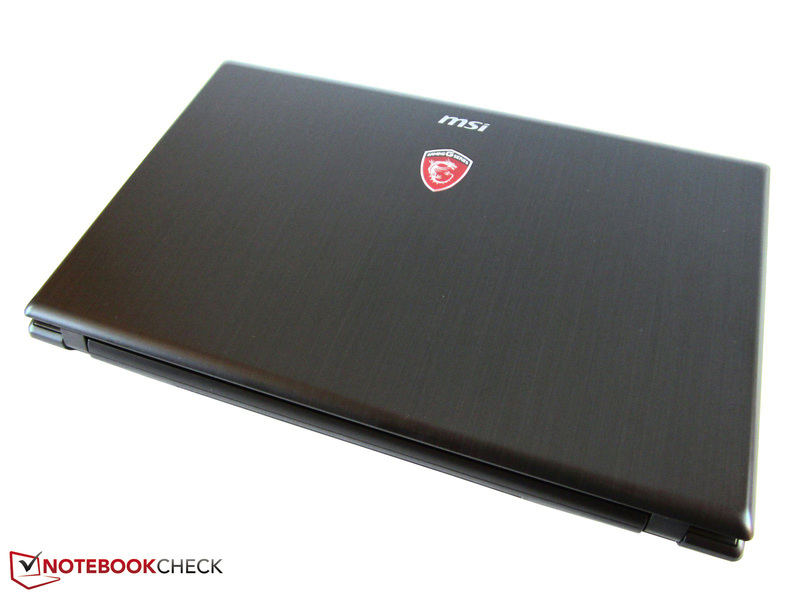 MSI has a 17-inch all-around laptop available that is aimed at multimedia fans and casual gamers. 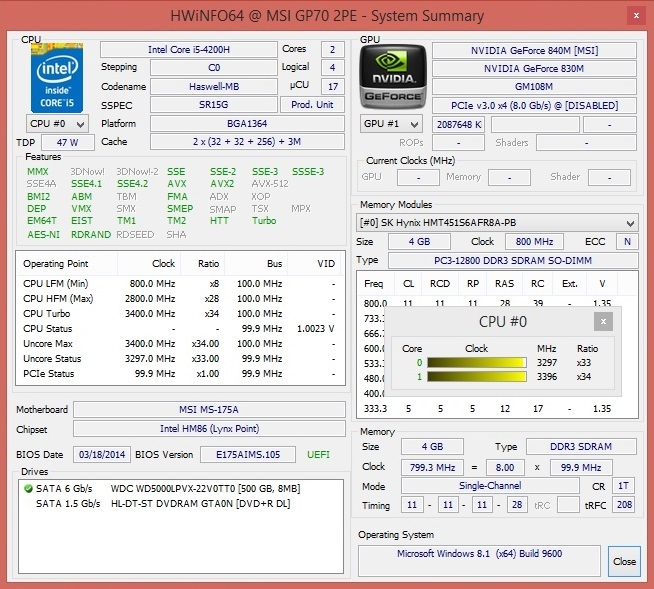 Read to what extent the GeForce 840M lags behind the more expensive models in this report. Is the GP70 worth its money? 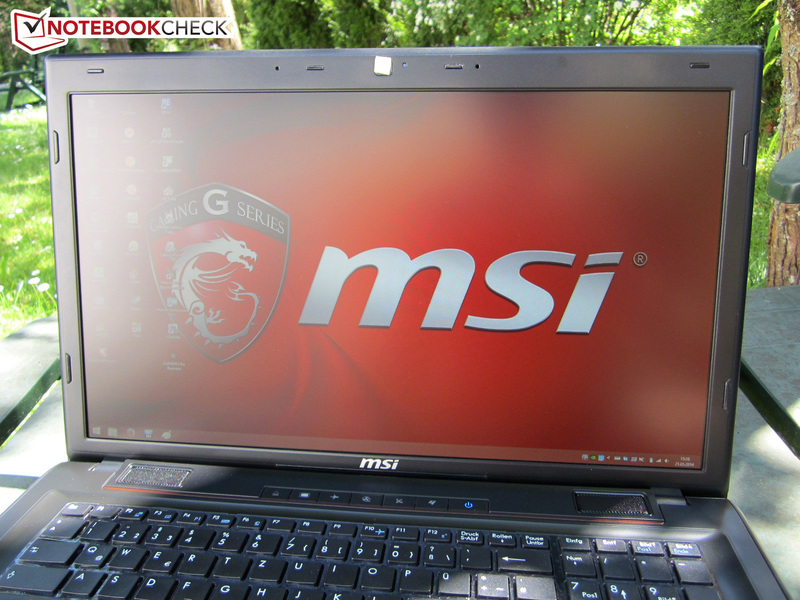 MSI classifies its GP70 as an affordable alternative for genuine gaming laptops from its GE and GT product line. Compared with the recently tested GE70, the less pricey brother not only comes without a backlit keyboard, but also does not feature high-quality aluminum surfaces. 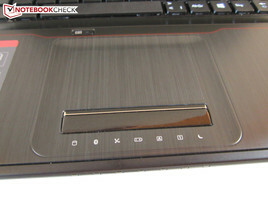 More differences are found in the design, touchpad, and sound system. One of its biggest drawbacks is the weaker graphics card. Instead of a GeForce GTX 850M or GTX 860M (GE series), the GP70 only sports a GeForce 840M. 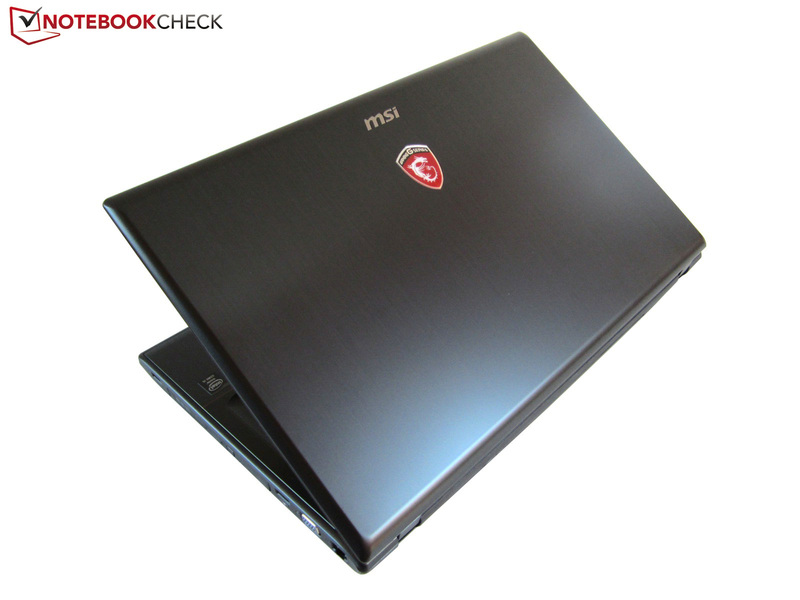 Either a Core i5-4200H (2.8 - 3.4 GHz) or Core i7-4700MQ (2.4 - 3.4 GHz) processor is installed depending on the model. That is supplemented by a DVD burner, four to eight GB of DDR3 RAM, and a 500 to 1000 GB HDD. The non-glare screen has a resolution of 1920x1080 pixels in every case. 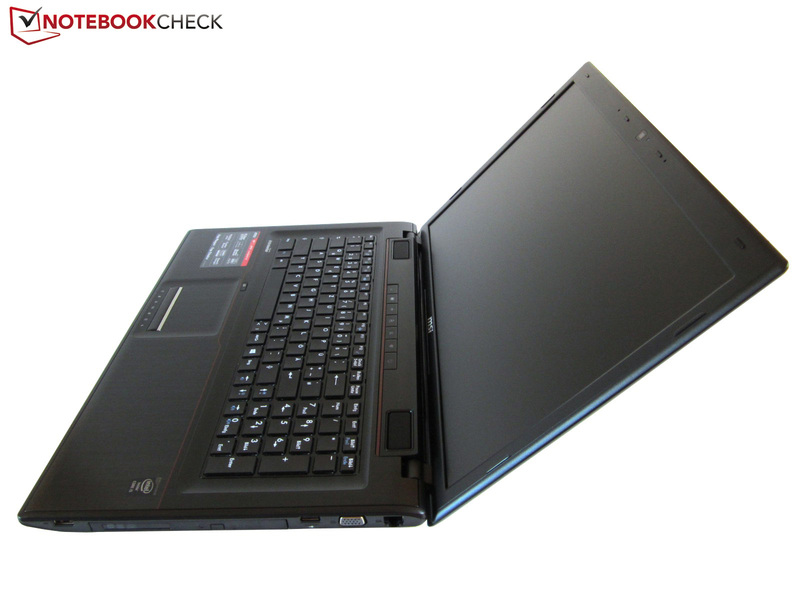 The purchase price ranges from 700 to 1000 Euros (~$952 to $1361) according to Notebooksbilliger's Internet shop that also provided us with the review sample. That is quite a low price for a gaming laptop. As known, there is no accounting for taste, and the GP70's looks will likely cause some mixed feedback. While the GE60/70 and GS60/70 (tests to follow), rely on a modern and fitting design line, the GP70 looks like a relic from days gone by. Particularly, the speaker bar with its special keys seems to be an artifact from 2000. However, the dedicated buttons are still more reliable than touch elements. Apart from the looks, the chassis makes a viable impression. Although the build and quality impression clearly lag behind the GE and GS line, top-notch quality cannot be expected in this price range. 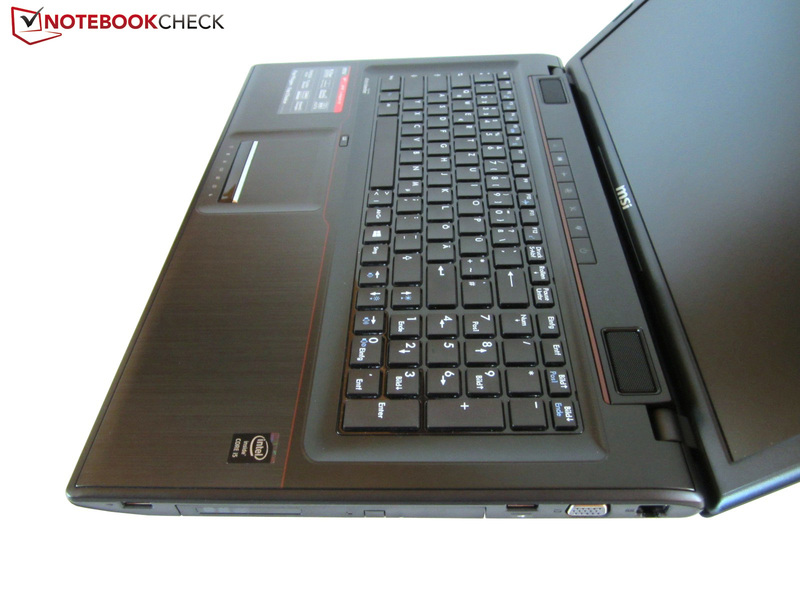 Buyers who do not have an overly high demand will deem the laptop solid. 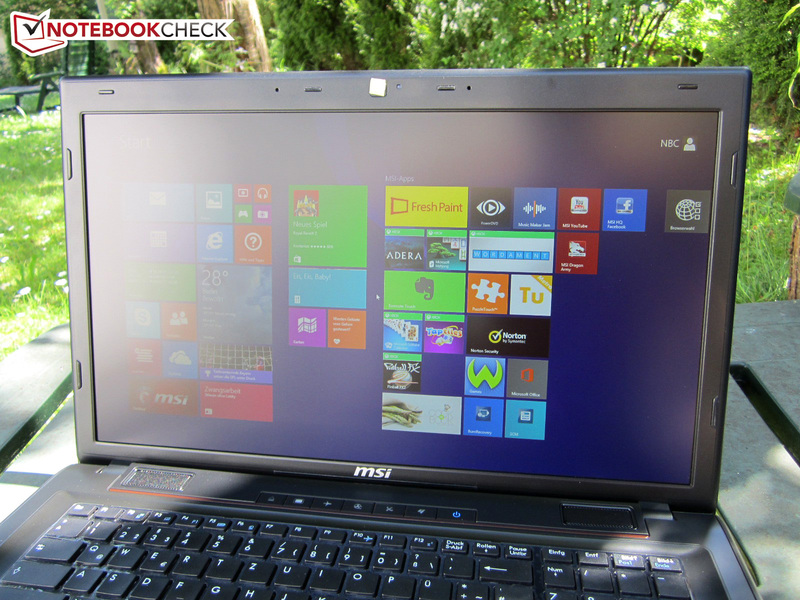 The all-around laptop neither makes a good nor a bad impression in terms of rigidness. The base unit is not excessively yielding as long as no high force is applied. 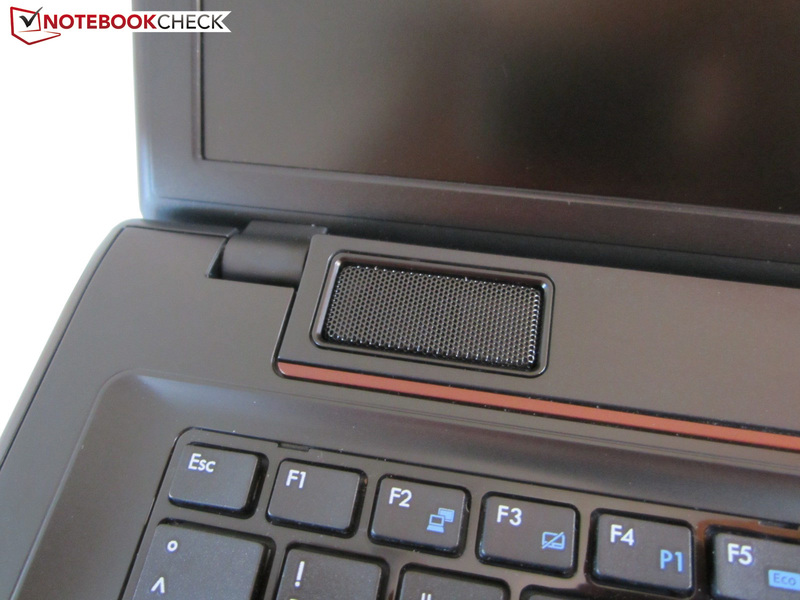 The lid could - like in most laptops - have a higher stiffness. The cover clearly warps if twisted with both hands. The size and weight are similar to the 17-inch GE70. 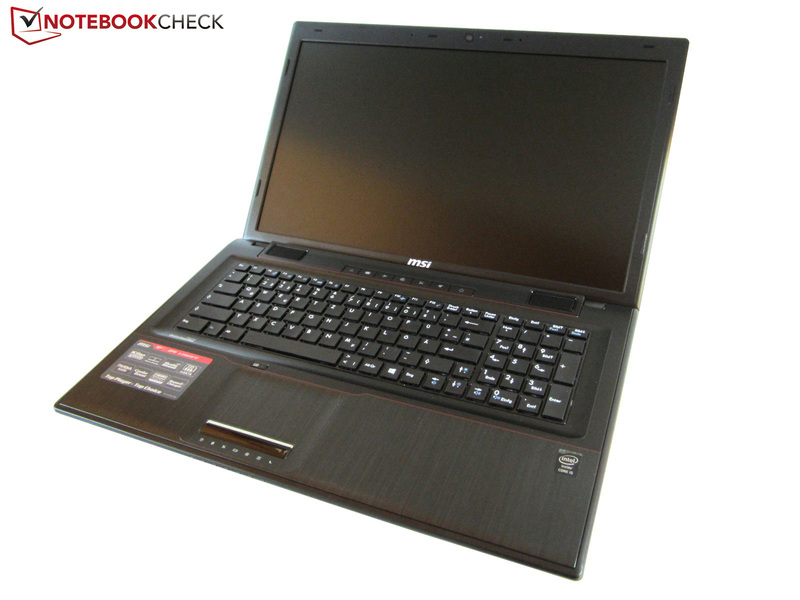 The GP70 can still pass as a multimedia laptop with a height of four centimeters (~1.6 inches). The same is true for its weight of 2.9 kilograms (~6.4 pounds). MSI does not try any experiments with connectivity. 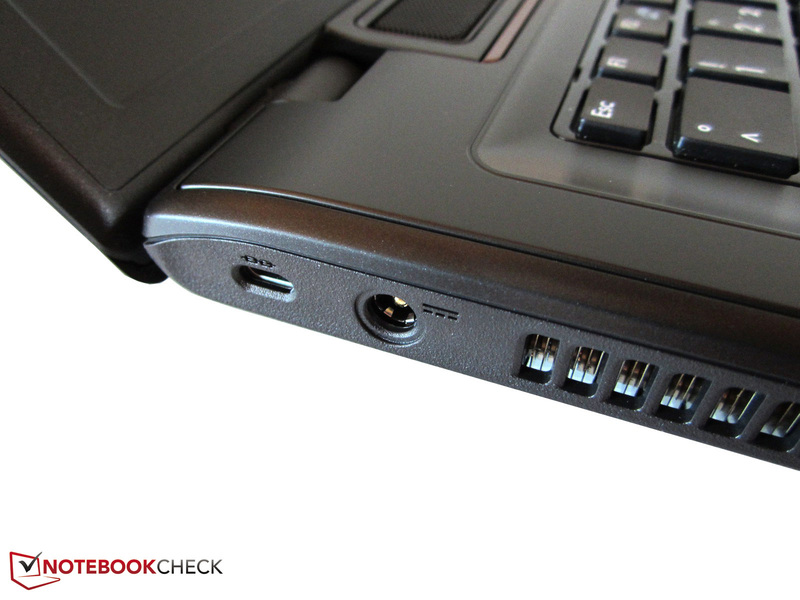 Two audio jacks and four USB ports correspond with the GE70 just like a VGA and HDMI-out, a card reader, and a Kensington lock. While right-handed users will easily manage with the interface distribution, left-handed users will likely get upset about the front-heavy positioning because it could lead to space problems when using an external mouse. Beyond that, left-handed users will be confronted with the fan's waste heat. The communication equipment can compete with the more expensive family members. MSI also installs the Killer e2200 Gigabit Ethernet Controller from Qualcomm Atheros that scores with clearly arranged software (Network Manager) in the GP70. The wireless module also makes a good impression. Intel's Wireless-AC 3160 provides more than appealing performance owing to 5.0 GHz and ac support. Bluetooth 4.0 and Wi-Fi 802.1 a/b/g/n are of course also supported. 2 - 4 bars were still available even at a distance of 10 - 15 meters (~33 to 49 feet) and through several walls. Most adapters achieve 1 - 3 bars in this scenario if at all. 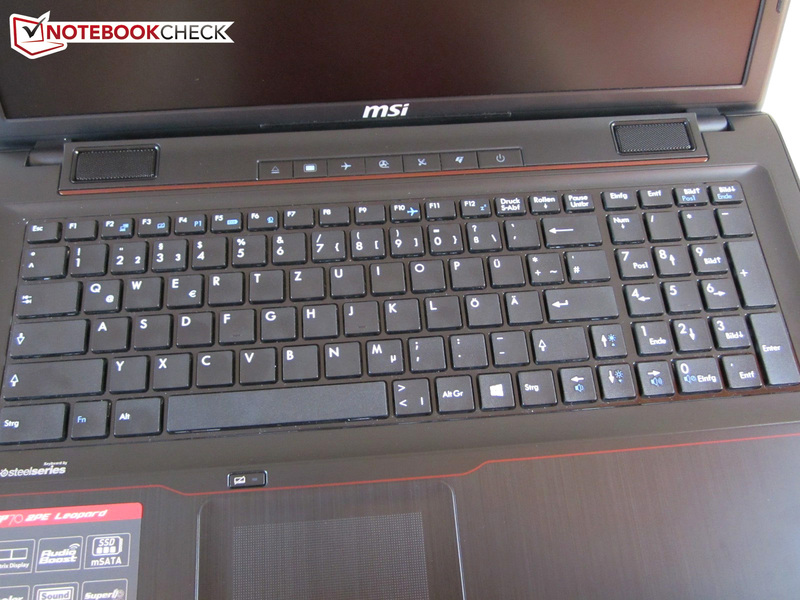 The maintenance options are good, as usual for MSI. 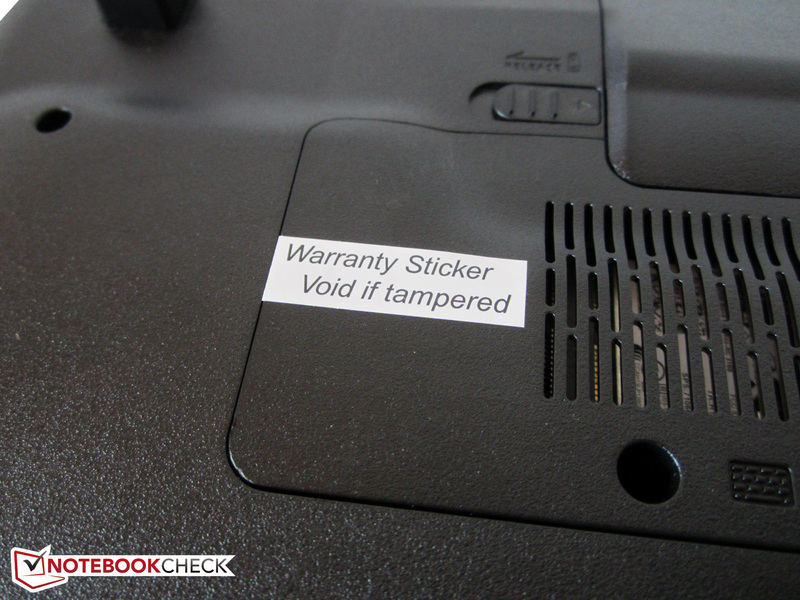 However, we did not take a closer look due to the warranty stickers. The insides should be (almost) identical with the GE70 because the casing's base is similar. As can be seen on the screenshots from our Polish colleagues, the wireless module, a 2.5-inch slot, an empty mSATA slot, and two working memory banks for a maximum of 16 GB of DDR3 RAM are underneath the generously sized maintenance cover. The cooling system (fan, heat pipes, etc.) can also be accessed in the GP70/GE70. It is too bad that neither the graphics card nor processor can be exchanged. We eye the generous software installation rather critically. 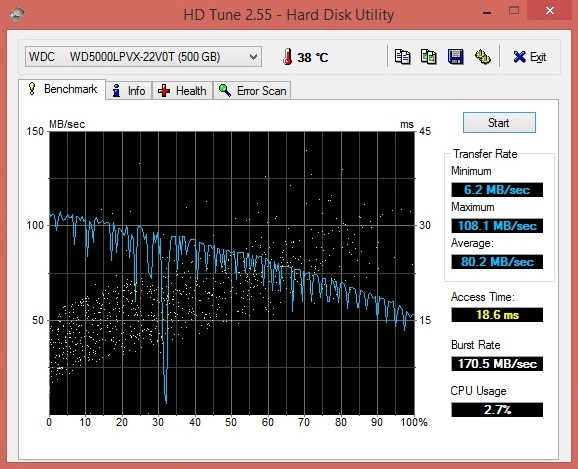 Unlike SSDs, HDDs have a hard time with simultaneously starting programs and tools. This is primarily noticed after booting. It takes some minutes before Windows runs smoothly. 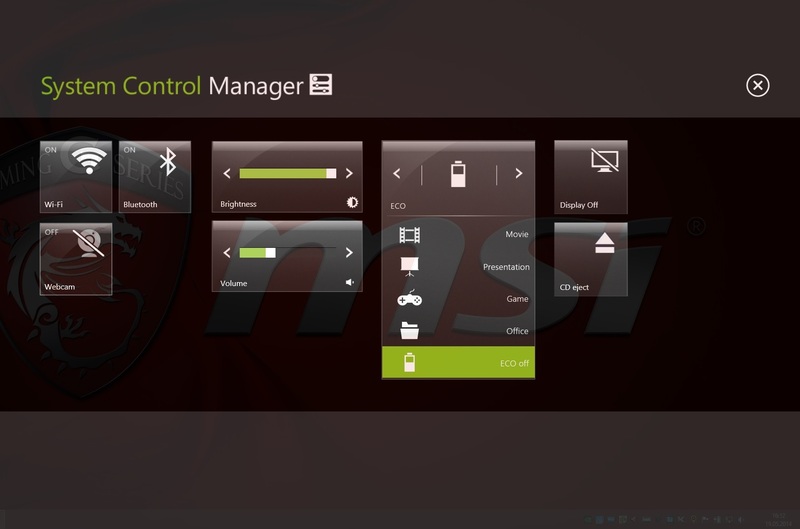 In addition to the security suite, a few other components have to be deleted to speed up the system (MSI Remind Manager, Dragon Gaming Center, etc.). The scope of delivery fits the purchase price quite aptly. 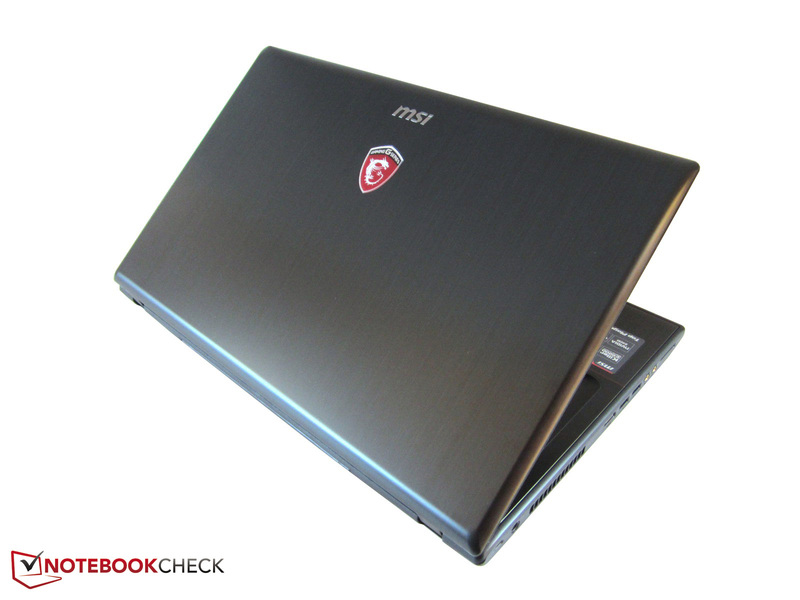 Although MSI does not include a recovery DVD, a driver DVD and several information leaflets (warranty card/booklet, quick start guide, etc.) are impressive. We particularly liked the slim power supply with a height of only 2.5 centimeters (~1 inch) (436 grams; ~15.4 oz). 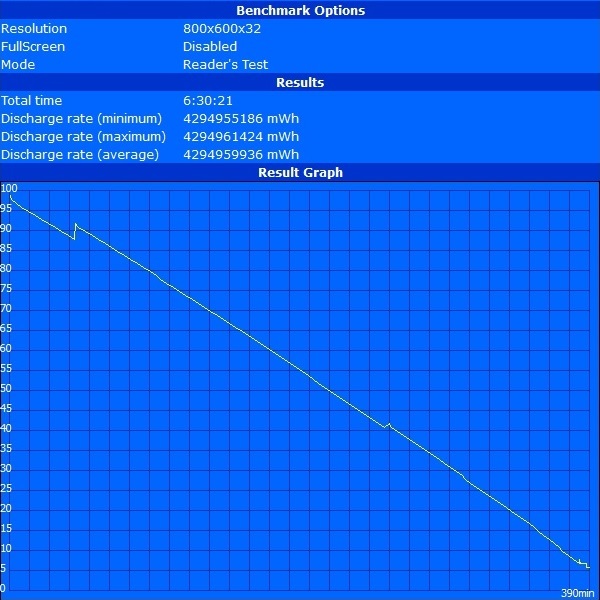 The just under 300 gram (~10.6 oz), lightweight 6-cell battery's 49 Wh is rather low. 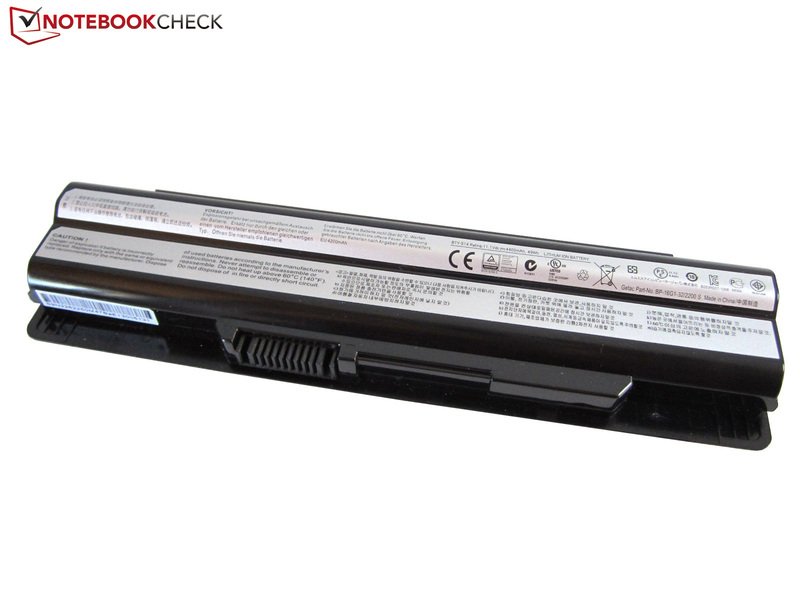 A two-year warranty period is included, which is standard in the laptop industry. As mentioned in the intro, the GP70 does not feature a backlit keyboard. Consequently, nighttime gaming sessions will only be possible in sufficient ambient light. 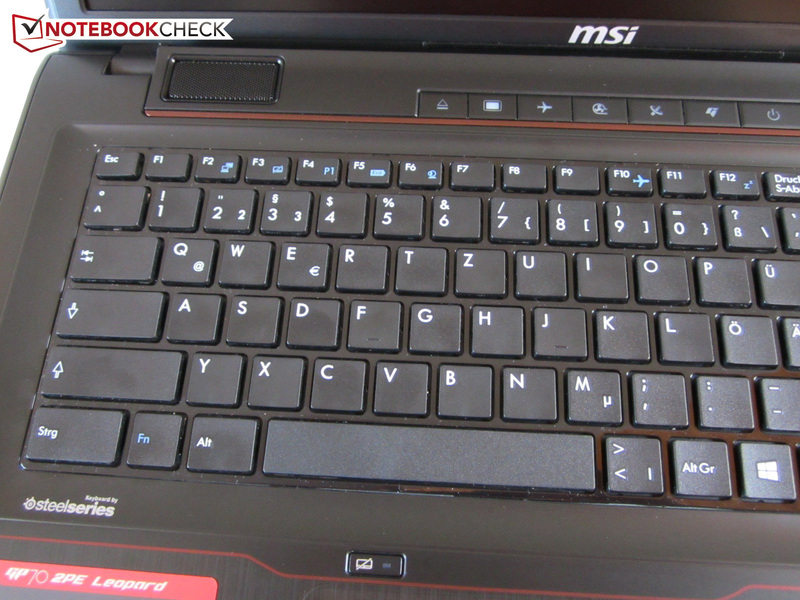 Otherwise, the chiclet keyboard made in conjunction with SteelSeries corresponds to that in the GE70. 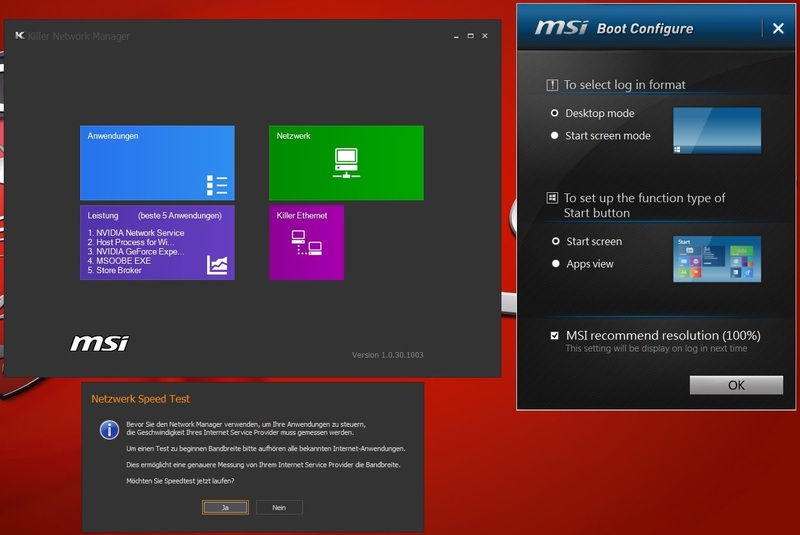 MSI uses a unique layout that has allegedly been optimized for gaming. However, incorrect inputs are frequent in the beginning. Whether or not the keys' arrangement will be appreciated after a long familiarization period very strongly depends on each user. In addition to the #' and <>| keys, the Windows key has also been moved. The single-row enter key also deviates from the German standard layout. MSI deserves kudos for the special functions. 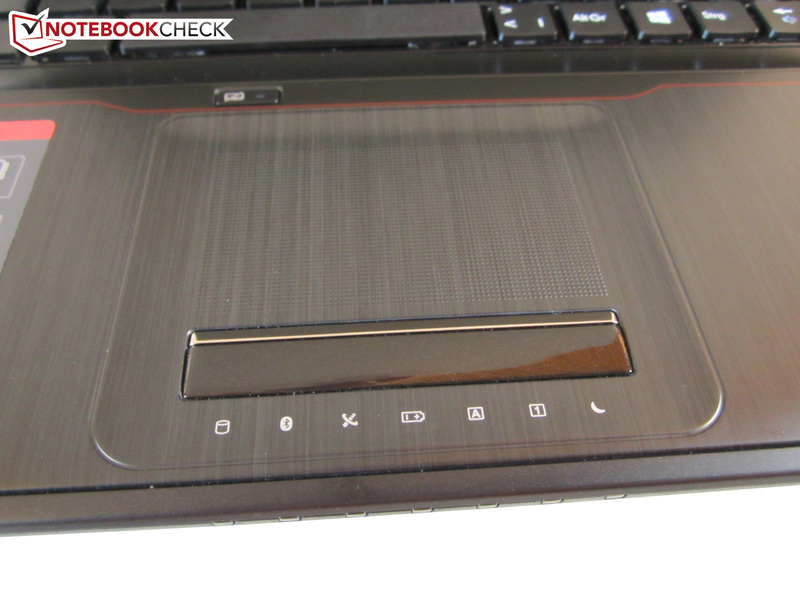 While the touchpad, webcam, and wireless module can be turned on and off via the F row, the volume and brightness controls are mapped to the arrow keys. 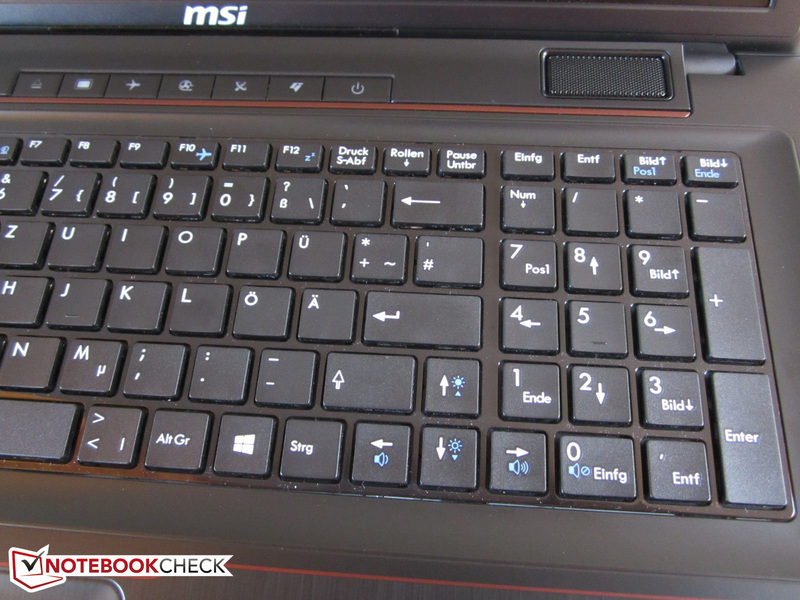 The additional keys that MSI implements above the keyboard proved especially handy. 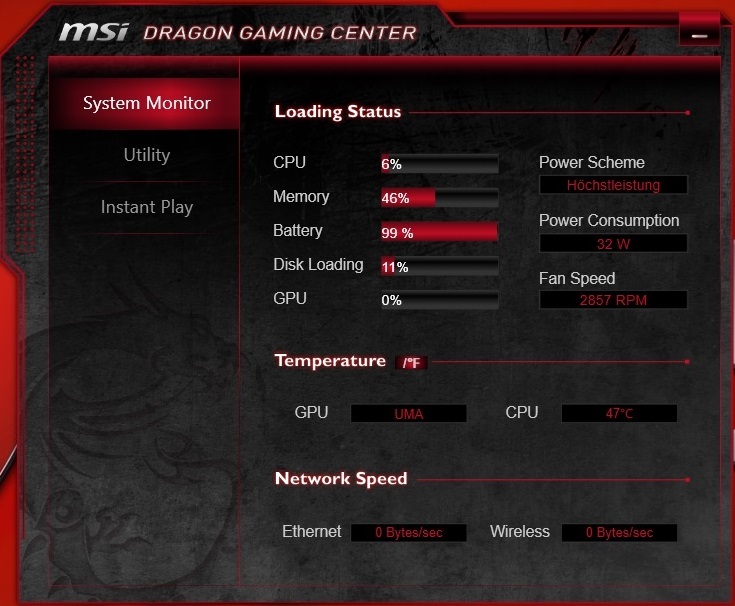 For example, the Cooler Boost (higher fan speed for better cooling) can be enabled here. Seen only technically, the keyboard is not ideal. Inputs make a slightly undefined impression - depending on the key - particularly since the typing noise (clattering) sounds rather cheap. 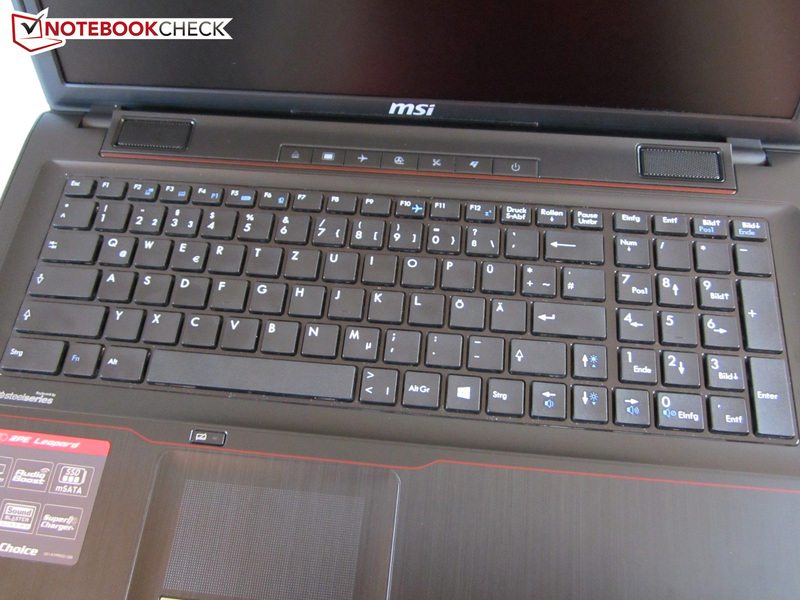 In our opinion, MSI has made the right decision in opting against a ClickPad. Mouse clicks are usually detected impeccably owing to the dedicated keys that are united in a solid "chrome bar". 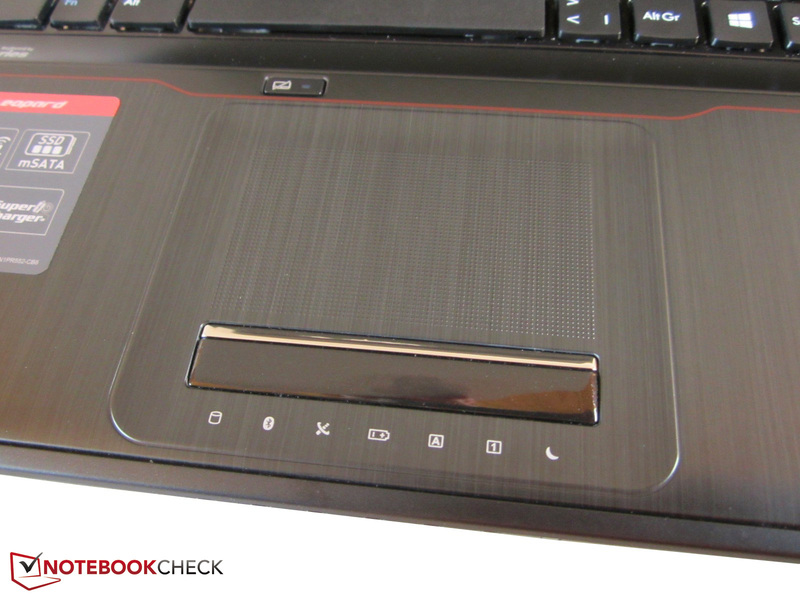 However, mixed feelings will emerge surrounding the touchpad's dotted surface. On the one hand, the mouse replacement provides a first rate feedback, and on the other hand, finger movements produce a loud grinding noise. 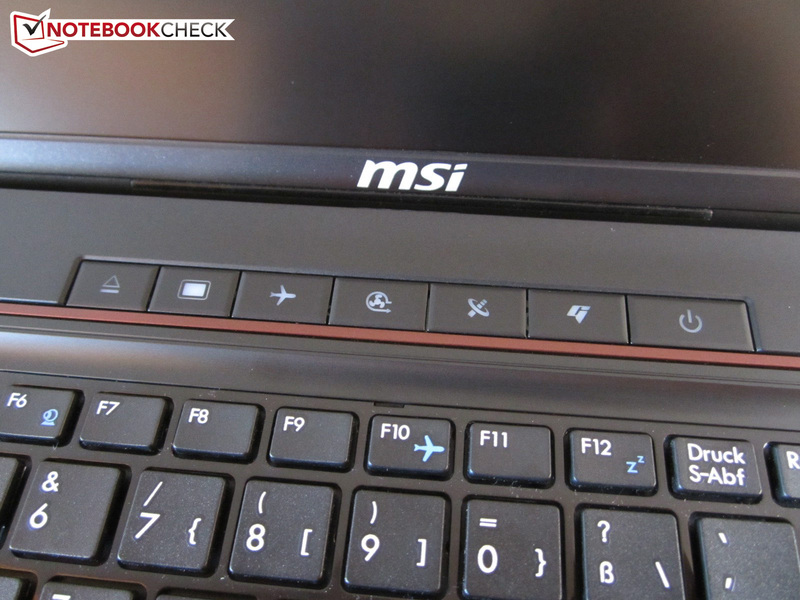 We also do not quite understand why MSI does not use the entire recess for the touchpad. 74 x 42 millimeters (~2.9 x 1.7 inches) are more common for 13 to 15 inch devices. Multi-touch support does not give us much reason for complaint. The supported gestures (zoom, scroll, etc.) mostly function impeccably. The touchpad is disabled when a mouse is connected. Unsurprisingly, the successful Chi Mei N173HGE screen is installed. 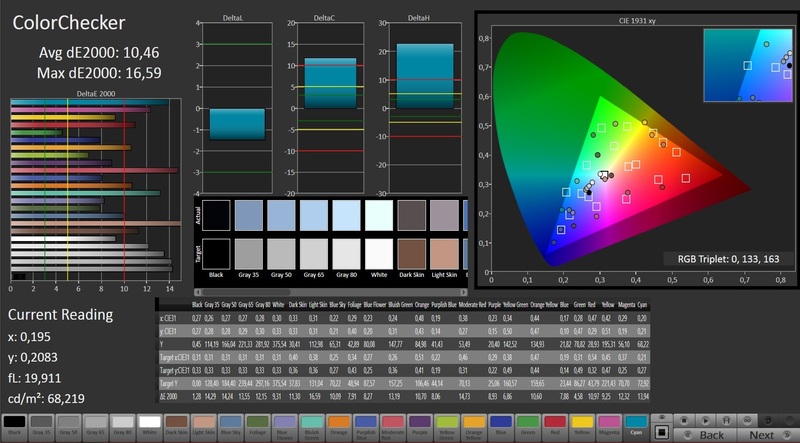 The display surpasses most 17-inch models with its average brightness of 335 cd/m². A contrast of over 900:1 is also top-notch, and points to a rich and bright colored reproduction. The black level should also satisfy gamers: 0.38 cd/m² prevent dark areas from drifting into gray too much, although the rate would have to be even a bit lower for a crisp black. We did not observe annoying screen bleeding in our review sample (87% illumination). However, this particular Chi Mei N173HGE panel suffers from coarse image reproduction as images do not appear as sharply as they should. Points are primarily deducted for the poor color accuracy. 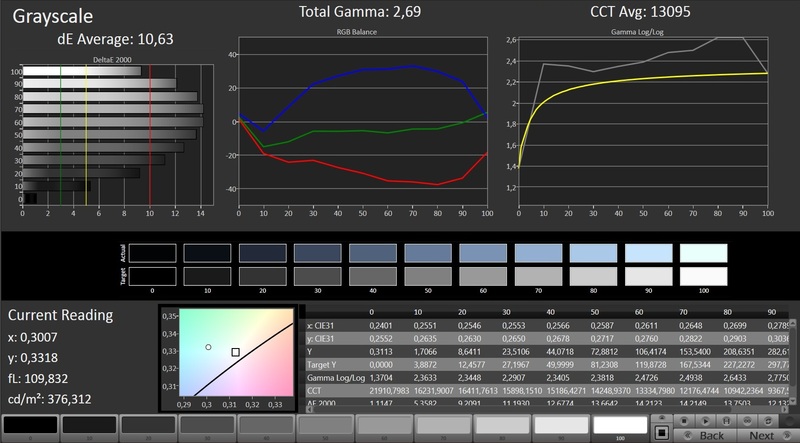 As our measurements with the professional CalMAN tool show, various elements (grayscale, RGB balance, saturation, etc.) are not perfectly synchronized. The typical bluish cast for laptops should, however, only discourage demanding buyers from purchasing. The omission of a high-gloss surface is primarily noticed in outdoor use. 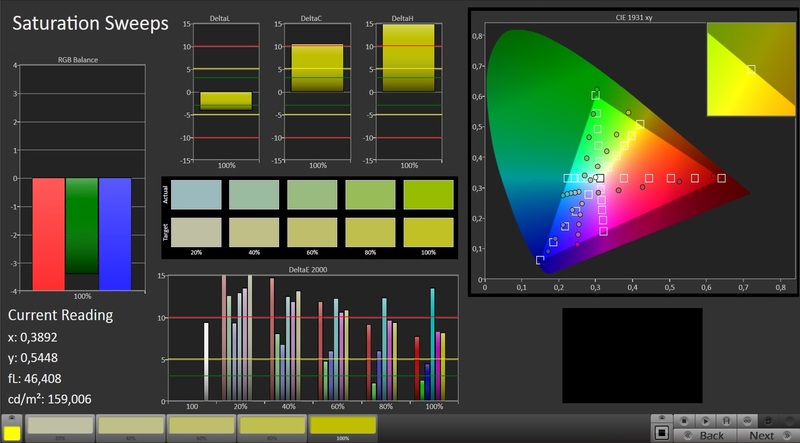 The extreme brightness and matte finish are easy on the eyes. The user is only faced with high strain on very bright days. 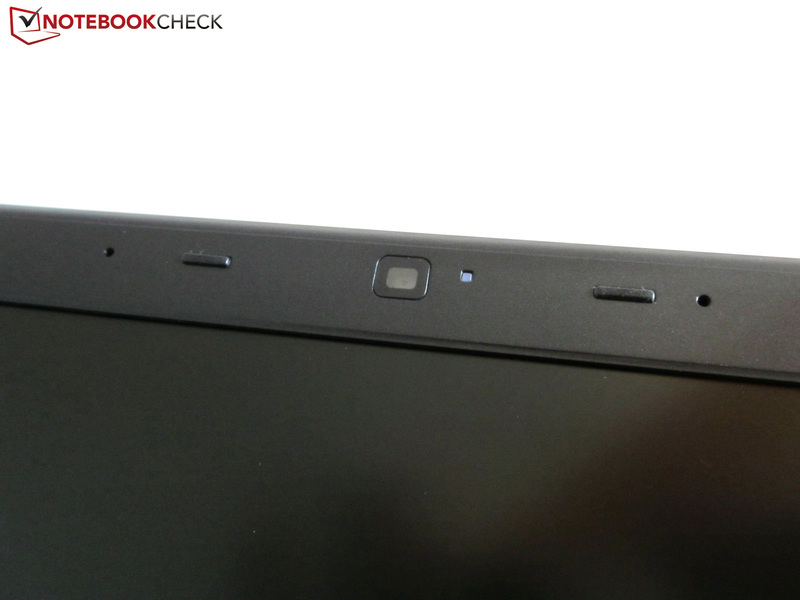 The viewing angle stability is located somewhere between a low-cost mainstream and pricey IPS screen. The content remains close to natural, both horizontally and vertically. The N173HGE only shows weaknesses when looking up from the sides. The Core i5-4200H is a 2.8 - 3.4 GHz dual-core CPU from Intel's Haswell generation that is correspondingly built in the 22 nm process. 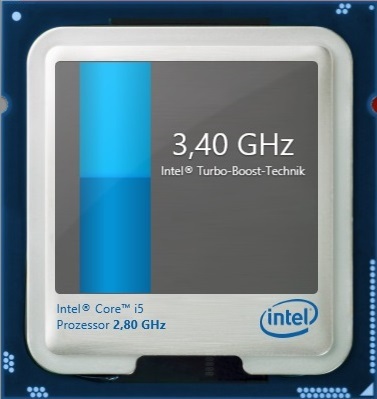 While the majority of dual-core CPUs are specified with a TDP of 37 Watts, the i5-4200H is specified with a whole 47 Watts, which corresponds to the level of the quad-core members. The other specs are as expected. In addition to a large three MB L3 cache, the HD Graphics 4600 DirectX 11 chip should be mentioned here. 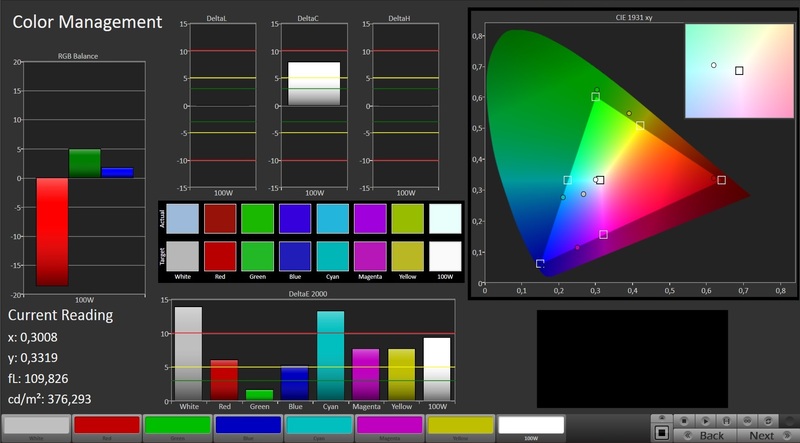 It is switched on via Nvidia's Optimus technology for basic tasks in the office, video, and Internet fields. 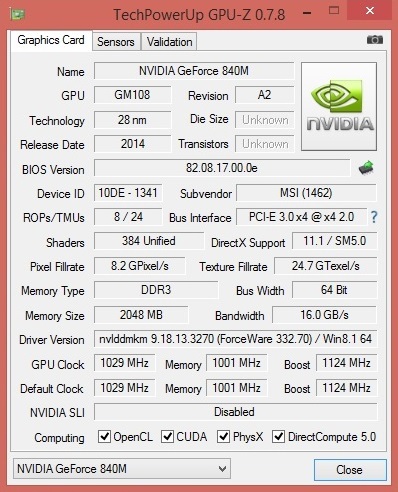 The GeForce GPU is automatically enabled during load (games, etc.). 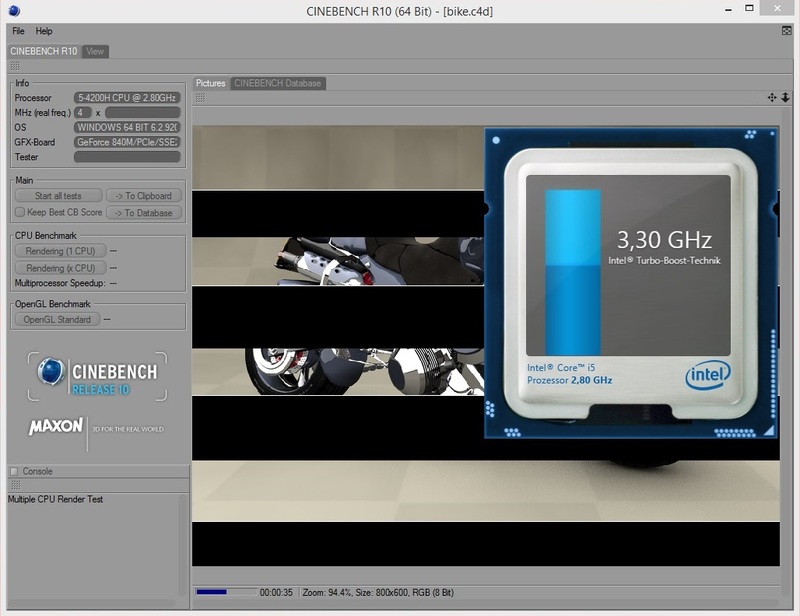 The Core i5-2400H always clocked at its limits in the pure CPU benchmarks. 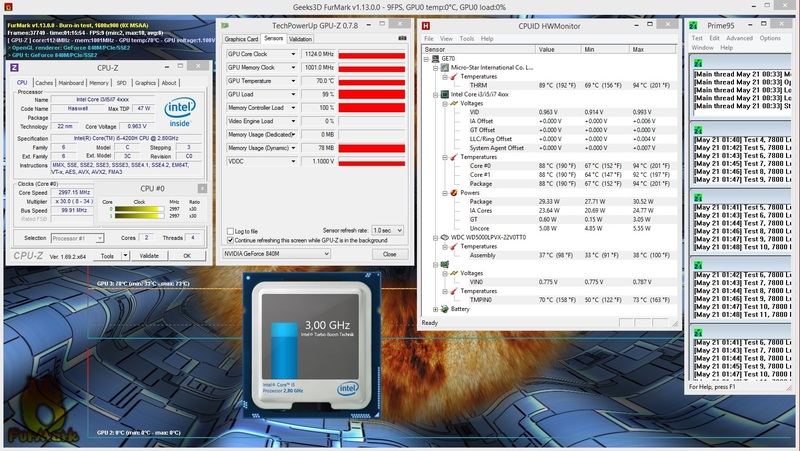 Just below 3.4 GHz in single-core, and 3.3 GHz in multi-core scenarios are more than satisfactory for a laptop. 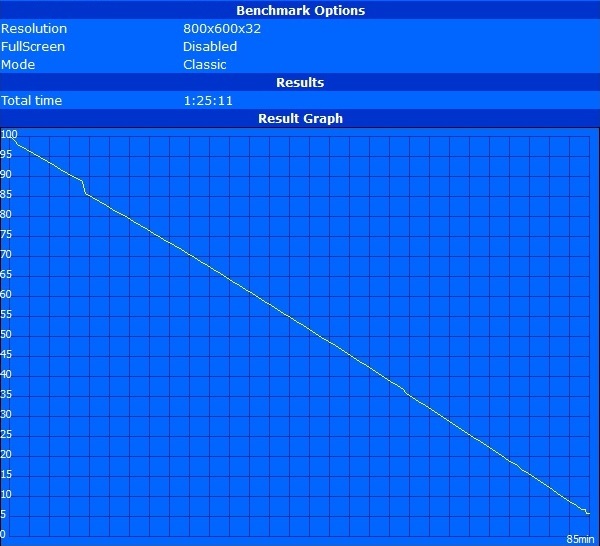 The review sample's Turbo behavior was a bit strange during simultaneous GPU load. 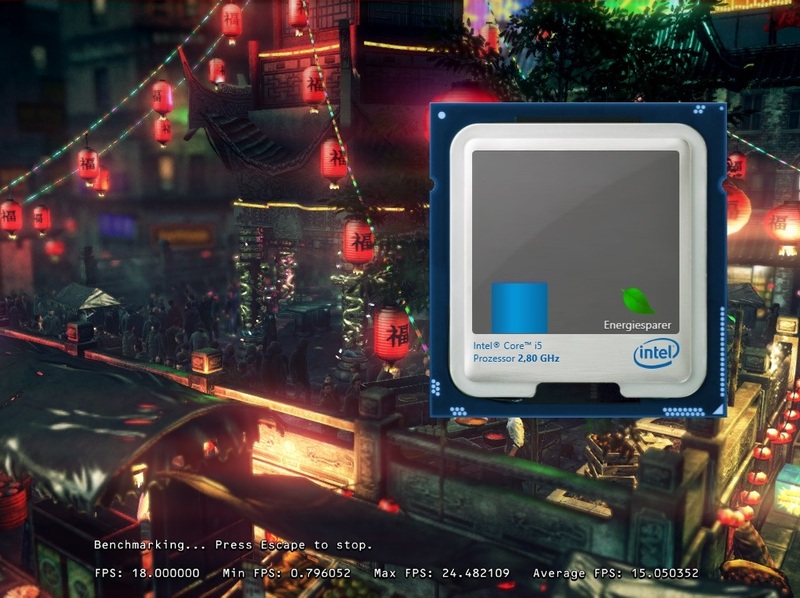 According to HWiNFO, CPU-Z and Intel's Turbo Boost monitor, the processor throttled in computing-intensive 3D programs (see screenshot of Hitman Absolution below). However, we will simply assume that it is a recording/measurement error since the clock in the stress test was normal, and the benchmark scores do not indicate throttling. 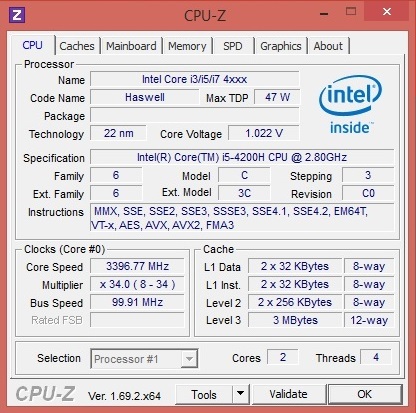 The performance of the Core i5-4200H is identical to that Intel's Core i5-4310M. 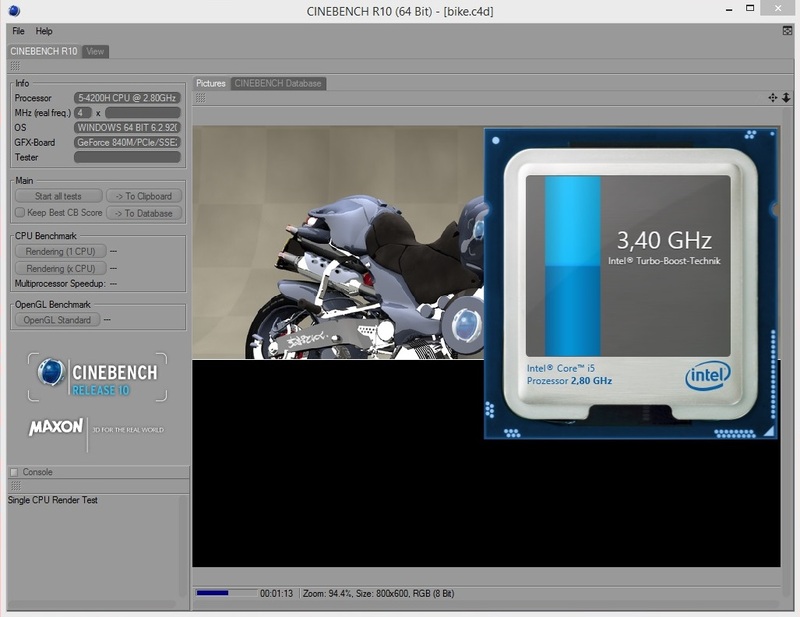 That is no surprise seeing that both dual-core CPUs have a very similar clock rate. 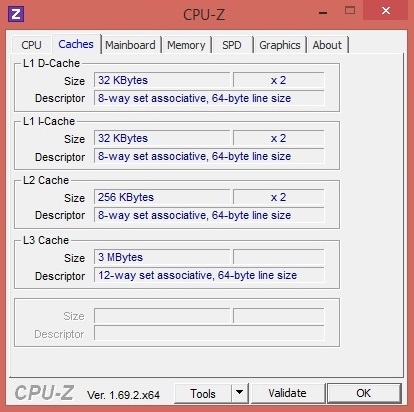 The difference to the quad-core models depends on the cores' load. 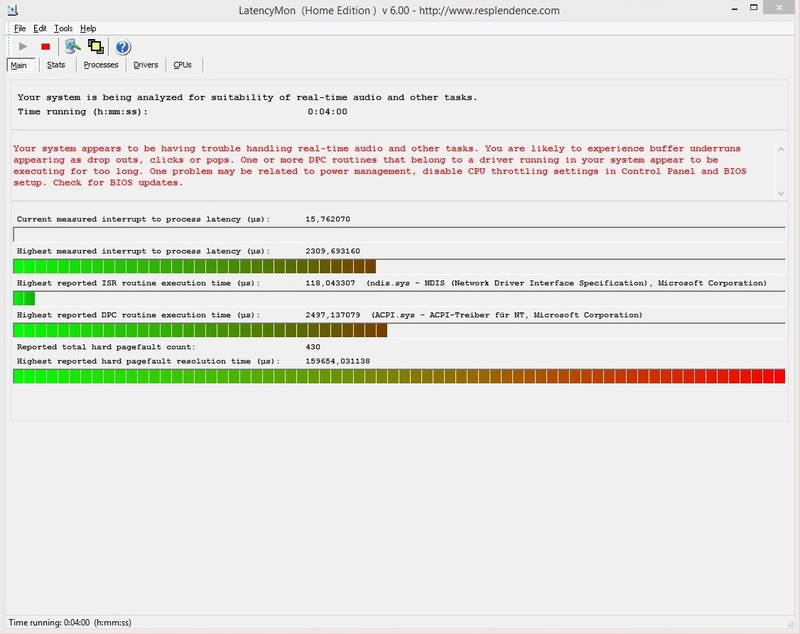 The Core i7-4700HQ can only take a clear lead in the multi-CPU test. 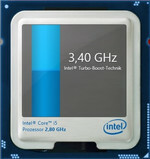 The quad-core calculates almost twice as fast with 642 to 324 points. In return, 131 to 129 points in the single-CPU test is identical. A dual-core generally still easily suffices for most applications. 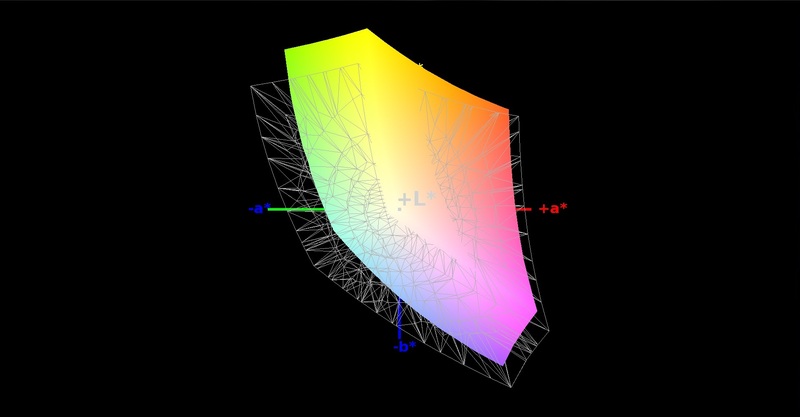 Unlike the low-end GeForce 820M model, the mid-range GeForce 830M and 840M do not come from the older Fermi, but from the energy-efficient Maxwell generation (both 28 nm). With 384 CUDA cores, the latter model is clearly below the GeForce GTX 850M that can fall back on 640 arithmetic units (+67%). Another advantage of the GTX 850M is its wider memory interface. 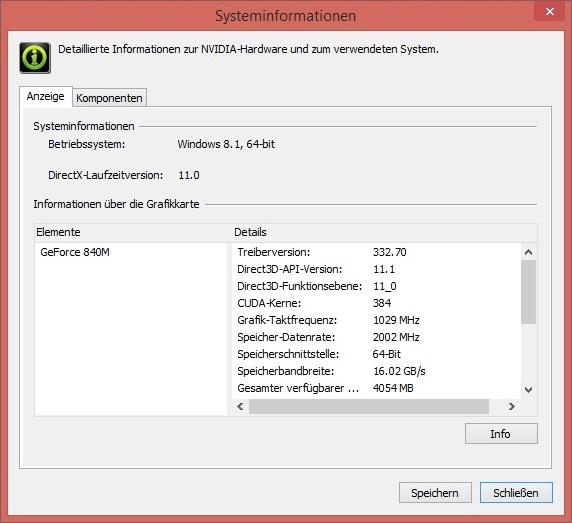 The GeForce 840M only has 64-bits rather than 128-bits and DDR3 video memory is used instead of a GDDR5 (GP70 vs. GE70). 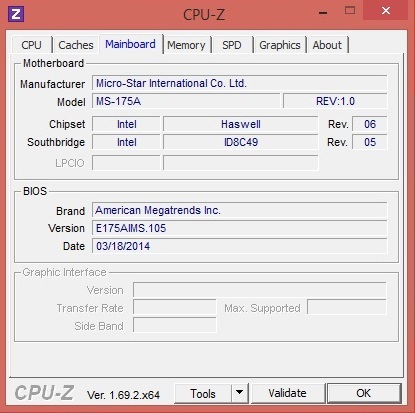 The clock rate is good; the core clocks with its maximum 1124 MHz even during full load. 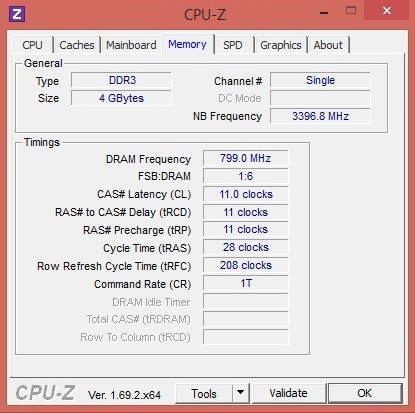 The base clock without GPU Boost is 1029 MHz. Despite the Maxwell architecture, the performance did not impress us. Although the GeForce 840M is over 50% faster than its predecessor in the Unigine Heaven 3.0 benchmark (14.4 fps @ HP Envy 15), 22.5 fps using 1920x1080 pixels and default tessellation are not really smooth. 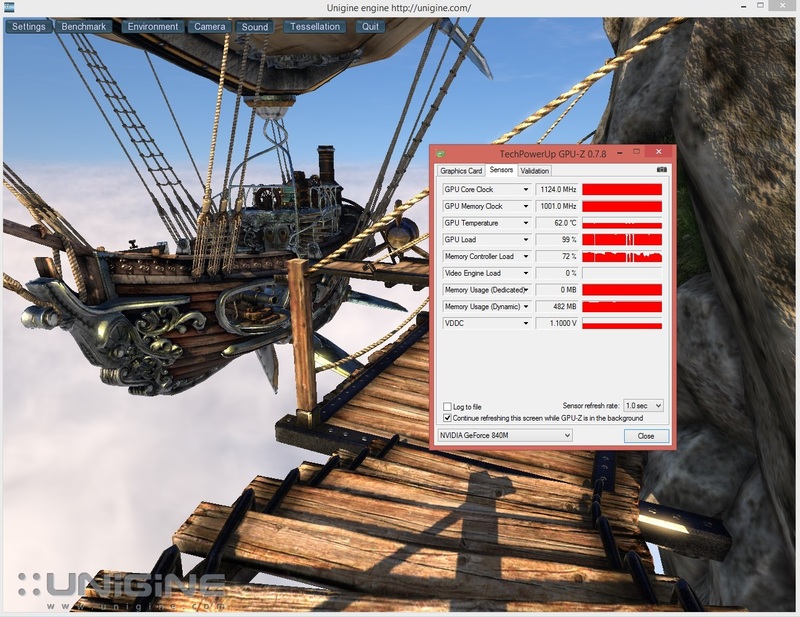 A laptop with a GeForce GTX 850M smoothly renders these settings (>40 fps). No mid-range graphics card performs 3DMark 13's Fire Strike test smoothly. The 1631 points that the GP70 achieves comes close to the score of the GeForce GT 750M DDR3 (1544 points @ Asus N550JV). 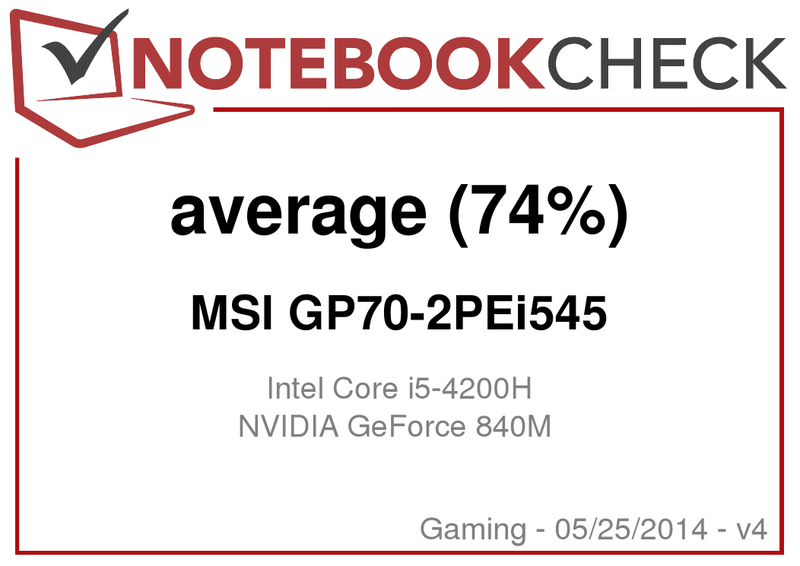 The laptop is far remote from a GTX 850M device that has a lead ranging from 90% (3082 points @ Nexoc M731) to 120% (3596 points @ MSI GE70) depending on the memory interface. 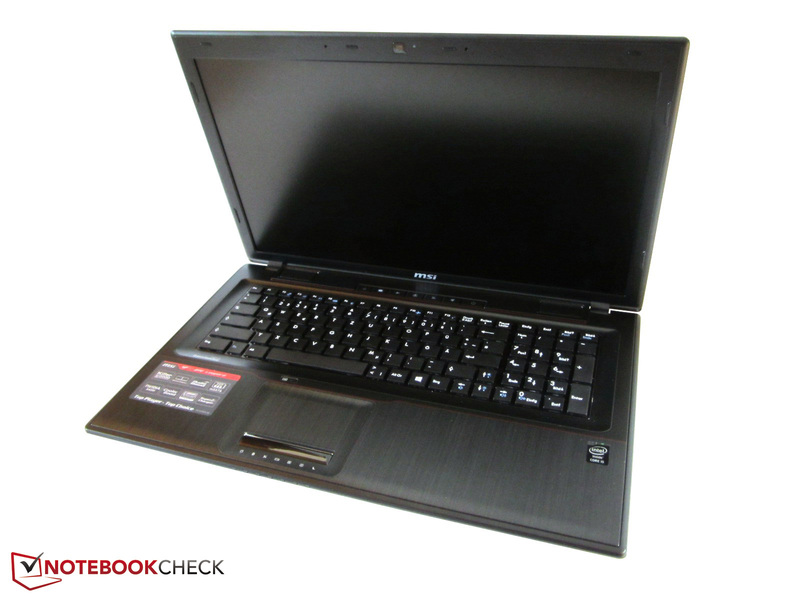 In return, the successor easily defeats a GeForce GT 740M (1190 points @ HP Envy 15). MSI divides the 500 GB storage device into two partitions (307 & 139 GB). Our benchmarks underpin that the Scorpio Blue WD5000LPVX does not belong to the strongest HDDs. An average transfer rate of 80 MB/s (HD Tune) will not awe anyone in 2014. It looks the same in CrystalDiskMark where it recorded a sequential read and write speed of 84 and 82 MB/s. The 5400 model also subjectively feels sluggish in both loading times and installations. 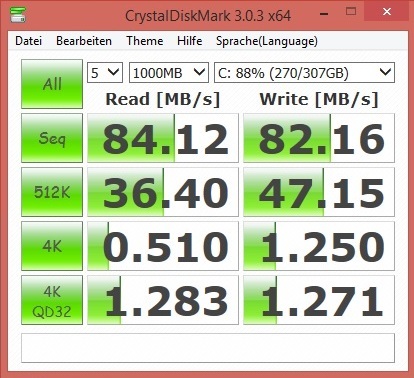 Users with the necessary money should definitely install an (mSATA) SSD. That would speed up Windows routine massively. 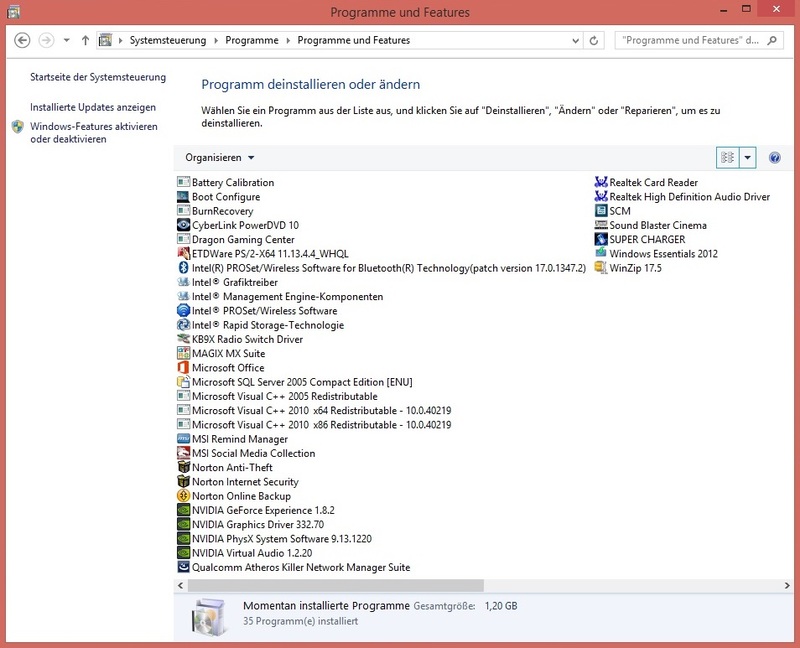 The system performance is satisfactory for an 800 Euro (~$1090) laptop. With a PCMark 7 score of 2965 points, the GP settles just below the GE70 review configuration that also does not sport an SSD (2995 points). 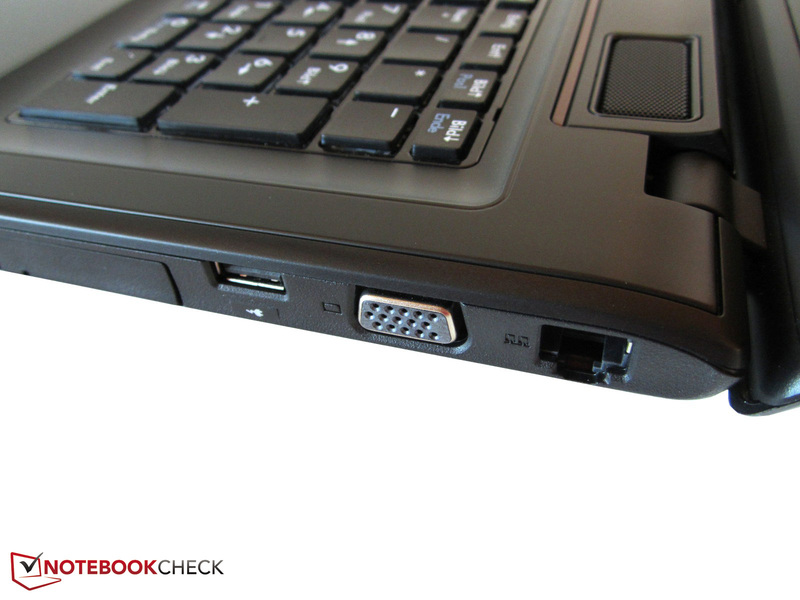 A few 100 points separate both laptops in the brand new PCMark 8. The GP70 is hardly suitable for passionate gamers. Although hardware-friendly games like F1 2013 and Dota 2 run decently even using maximum details and 1920x1080 pixels, it is often still just enough for medium to high details in 1366x768 or 1600x900 (see chart). 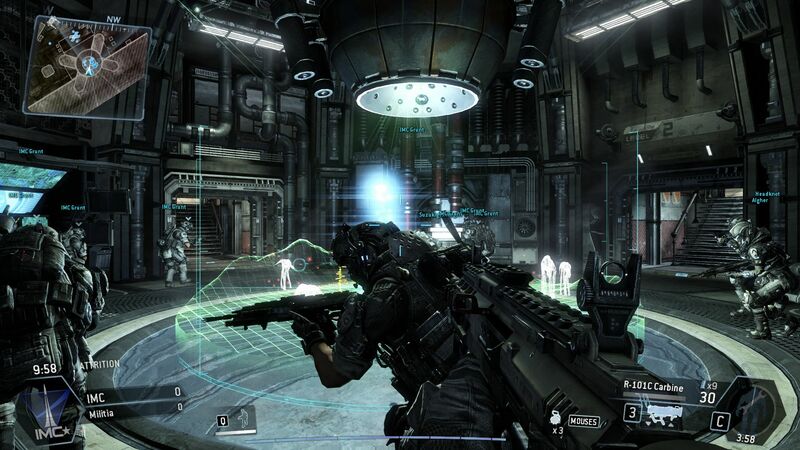 Low settings and absolutely no anti-aliasing have to be accepted in extreme cases like Crysis 3. Analogous with the synthetic graphic benchmarks, the performance difference is also gigantic in the gaming tests. It is ultimately +64% in favor of the GeForce GTX 850M DDR. The difference to the GDDR5 model is even more massive with a lead of almost 100%. 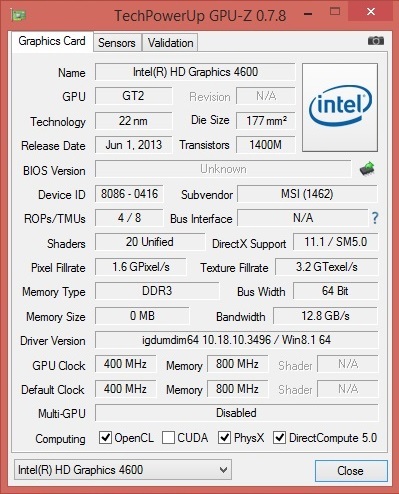 The older GeForce GT 750M also calculates faster, although its lead is only 10%. At least the GeForce 840M surpasses the GT 740M by over 20%. Users who play regularly should take at least a GeForce GTX 860M. Extreme compromises have to be made in up-to-date games without a high-end chip. The noise level is in the mid-field. 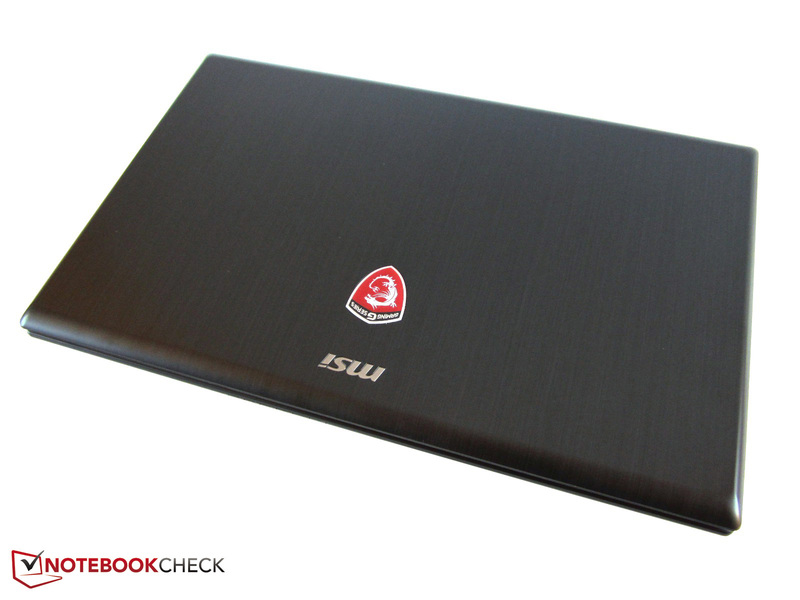 Like other MSI laptops from the GeForce 800 generation (GE60, GT60, etc.) proved, the fan is always on in idle mode. Just under 34 dB(A) are unduly high in view of the temperatures. 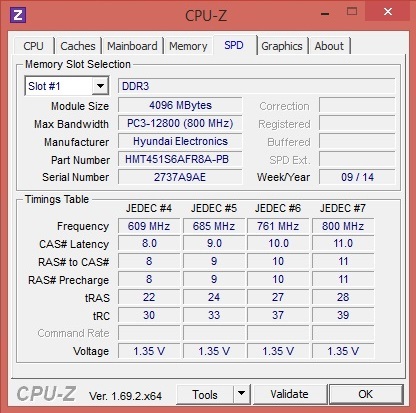 The Asus X750LN 840M contender is satisfied with 32 dB(A) when idle. The GP70 fared quite well during load. We only measured 36 - 42 dB(A) in the 3DMark 06 graphic tests (46 dB(A) @ CPU tests). Clevo's W670SJQ barebones reached an average of 47 dB(A), which is considerably more. We would like to compare the temperature development with the GE70, which features a very similar build except for a few details. The GP70 remains significantly cooler during load due to its weaker hardware. Hardly a user will find up to 41 °C (105.8 °F) on the upper side, and a maximum of 47 °C (116.6 °F) on the underside distracting, especially since these rates were only achieved under extreme conditions. 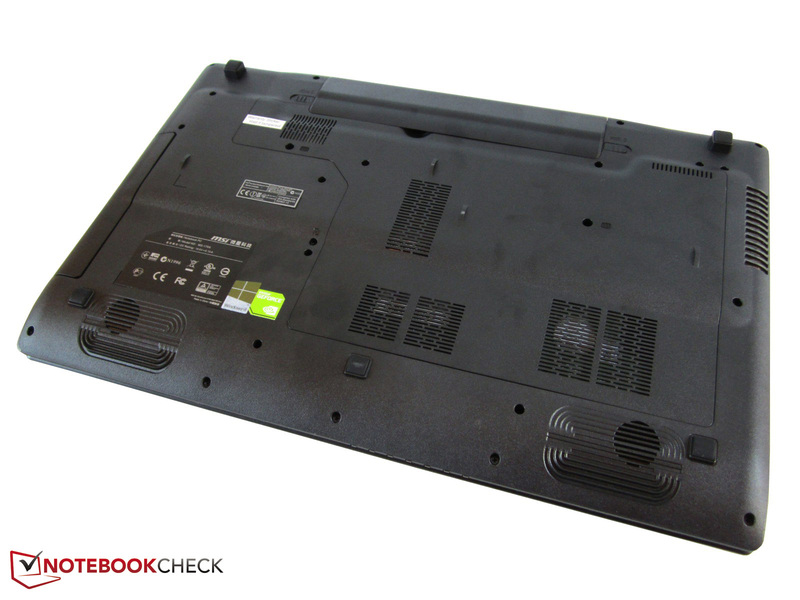 The GE70 struggles more with the cooling considering a maximum temperature of 47 °C (116.6 °F upper side) and 58 °C (136.4 °F; underside). Both devices are roughly on par during basic tasks. The GP70 and the GE70 finished our idle measurements with an average of 28 °C (82.4 °F). 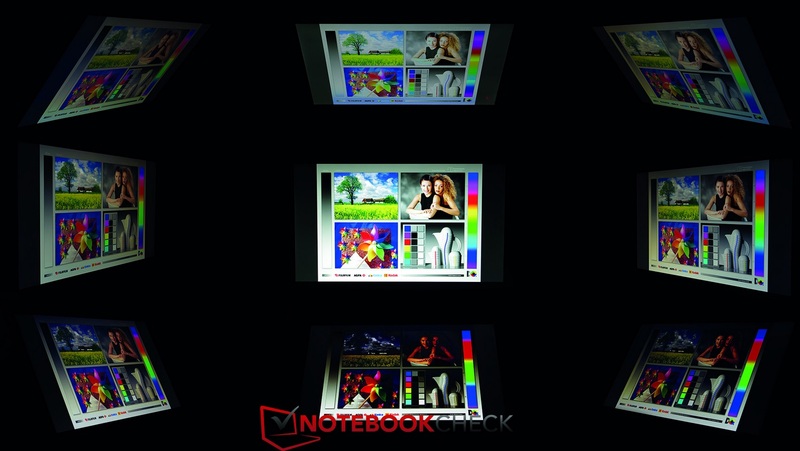 Again, bigger differences are noticed with the graphics chip. Despite throttling, the temperature of the GeForce GTX 850M in the GE70 climbed to over 90 °C (194 °F) (GP70: maximum 73 °C; 163.4 °F). It is a long known fact that Intel's Haswell generation produces a lot of waste heat. No matter whether the Core i7-4700HQ or Core i5-4200H - most CPUs settle to around 90 °C during full load. 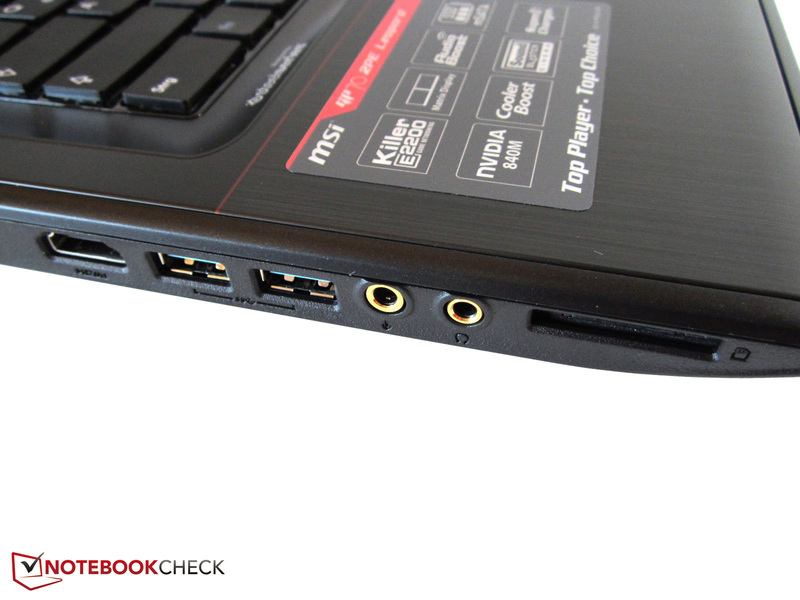 Although there are no logos on the laptop that indicate it, the sound system allegedly comes from Dynaudio. Unlike the GE70's four speakers, there are only two speakers inside the GP70. However, the GP70's sound is not much worse because the Sound Blaster Cinema technology is again used. Several enhancements can be turned on and off to change the global scenario via the pre-loaded software (right screenshot). We would call the 2.0 system's sound quality decent. The good volume is primarily mentioned on the pro side, although it leads to a muddy and frayed sound impression depending on the level. 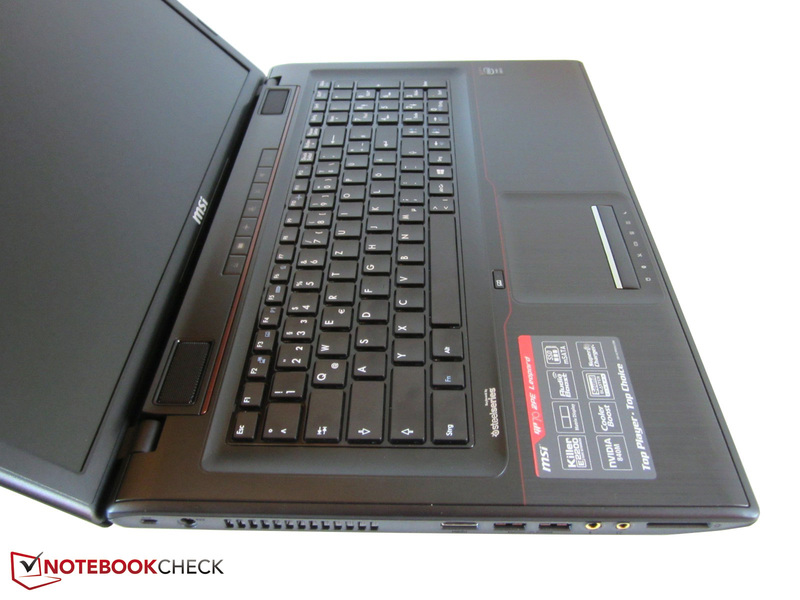 Nevertheless, the GP70 sounds better than standard laptops. 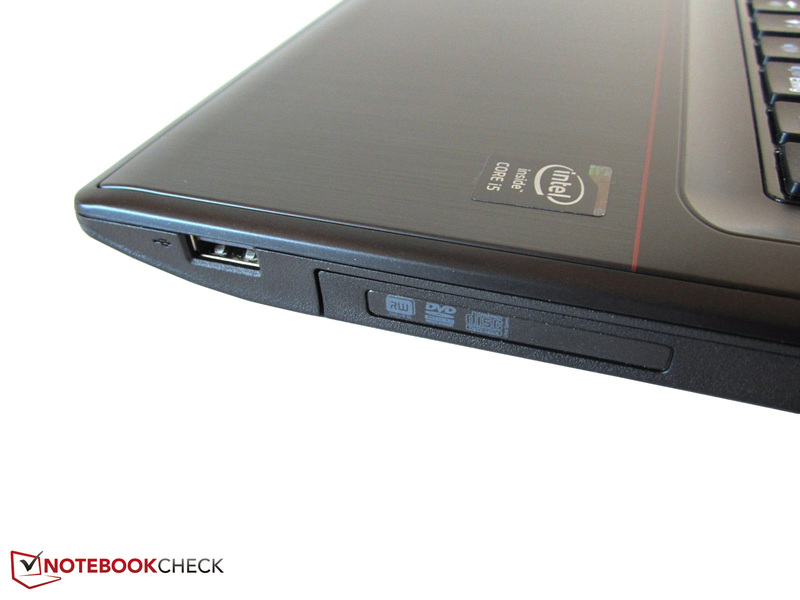 One of the biggest assets of the 17-inch laptop is its moderate power consumption. With 6.5 - 21.6 Watts, the all-around device consumes roughly the same amount of energy as HP's Envy 15-j011sg with a Core i5-4200M and GeForce GT 740M (7.9 - 18.4 Watts). The higher efficiency of the Maxwell architecture is primarily seen during load. Despite its considerably higher performance, the GP70 barely consumes more power than HP's contender. 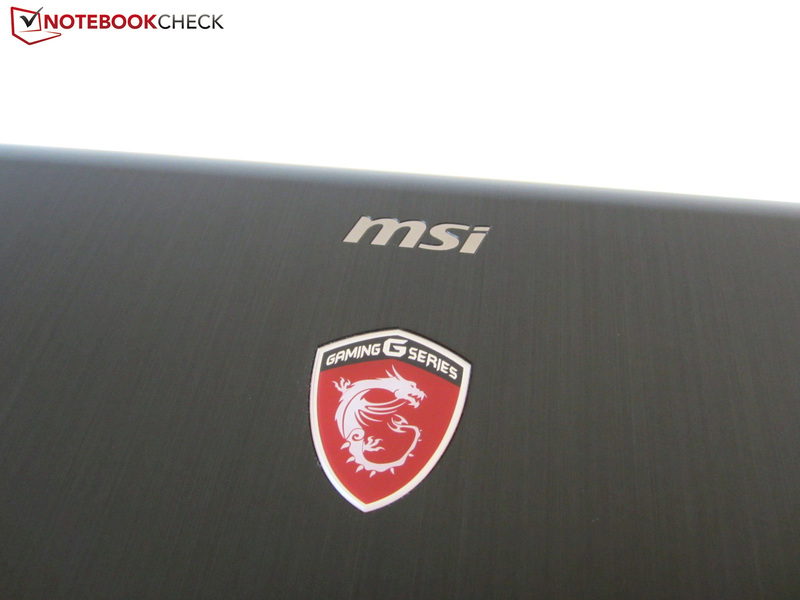 We managed to drain an average of 56.3 in contrast to 51.5 Watts from MSI's laptop in the first scene of 3DMark 06. The maximum rate is 80 Watts, which points to a sufficiently sized power supply (should also apply to the quad-core version). 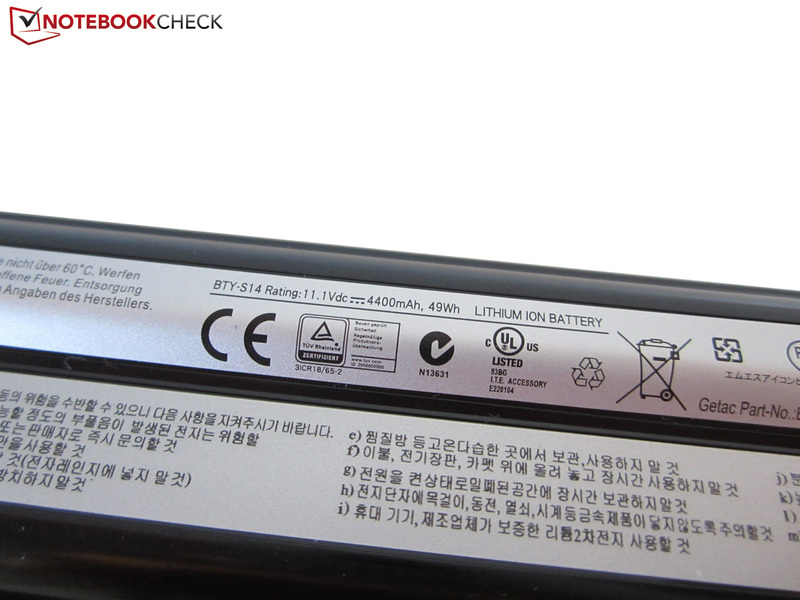 The battery's low capacity is noticed in the runtime tests. 49 Wh or 4400 mAh is quite little from a laptop point of view, and prevents Nvidia's Optimus technology from developing its full potential. Although 6.5 hours of idling in minimum brightness sounds good on paper, not quite three hours of Internet browsing (medium screen brightness), and two hours of DVD playback (maximum brightness) are in no way awe-inspiring. The battery lasted for approximately 1 - 1.5 hours in gaming operation. The GP70 can only be called a bargain to a certain degree because MSI cuts costs wherever it can. While a dual-core processor is still tolerable and does not have a negative impact in practical use, the GeForce 840M very frequently finds its limits. The main reason is the narrow memory interface of just 64-bits. In our opinion, the slow hard drive is the biggest point of criticism as it has also been unnecessarily "stuffed" full of bloatware. MSI should hold back a bit on that in the future or install a bigger / faster HDD from the outset. Other drawbacks are the missing keyboard backlight and the stale design. Beyond that, buyers will find manufacturing flaws. Many areas have irregular transitions, which considerably lessens the quality impression. The unusual keyboard layout and dotted touchpad also need getting used to. On the positive side, the screen stands out. It is bright with high-contrast and the viewing angle stability is reasonable - every multimedia user wants that. 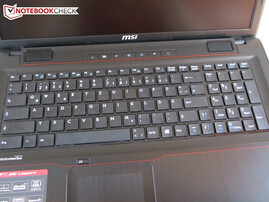 MSI also has to be praised for the good communication equipment that meets more than just mobile requirements. Then there are acceptable temperature and noise development, which is not a matter of course - at least not in gaming laptops. 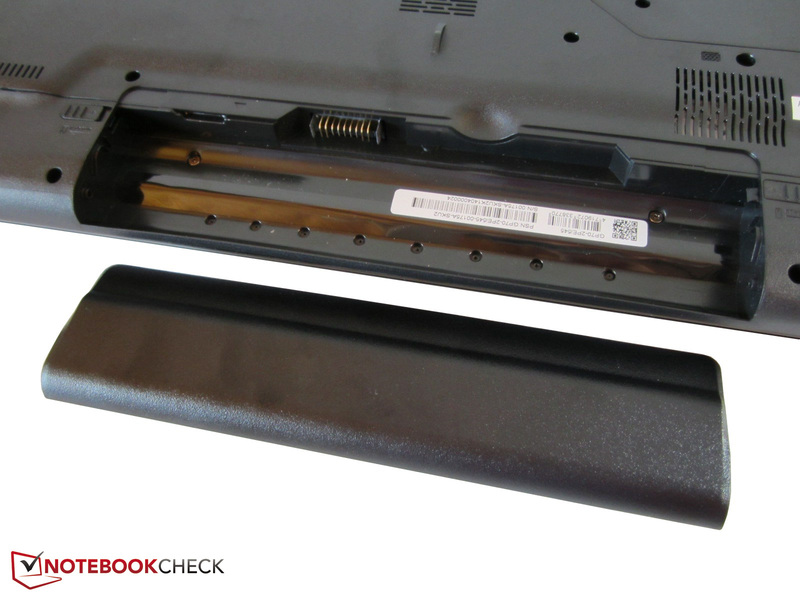 The speakers' decent sound and the large maintenance cover must also be mentioned. Despite all that, it is still only enough for a "Satisfactory" owing to the listed drawbacks. 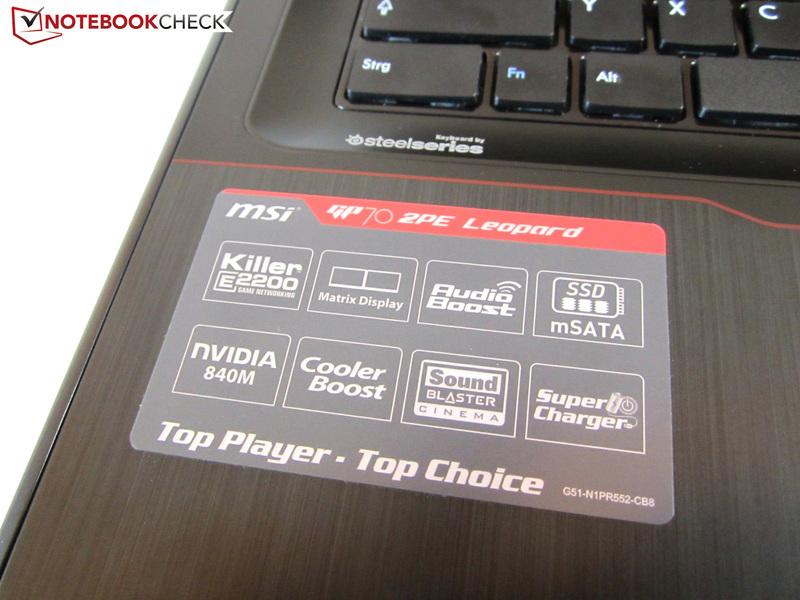 MSI GP70 Leopard. Review sample courtesy of Notebooksbilliger.de. ...it is more flashy inside. The underside is absolutely identical with the GE70. 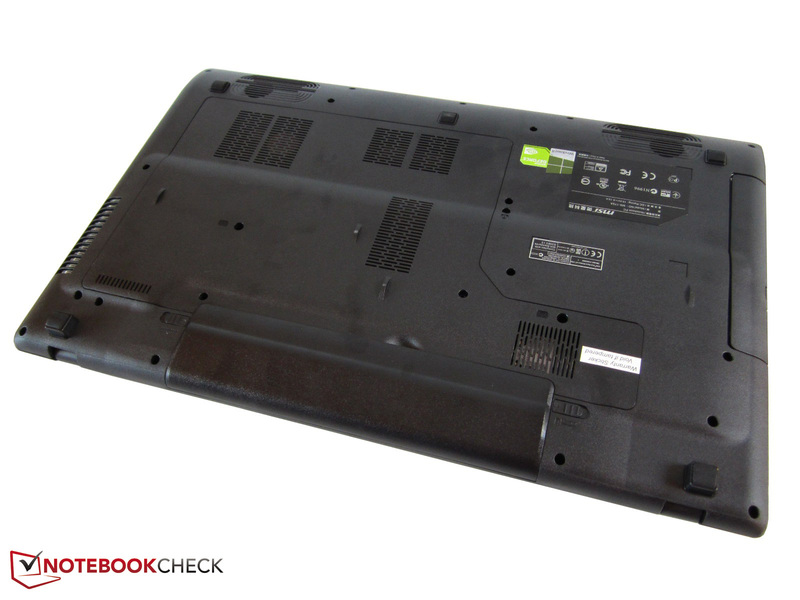 The laptop weighs just under 2.9 kilograms with the battery. The display can be opened to approx. 135°. No interfaces are on the rear. The casing is mostly matte. The base plate is secured with several screws. The surface texture looks like brushed aluminum. A dragon logo adorns the cover. We cannot provide pictures of the hardware. MSI dubbed the chassis MS-175A. The speaker grilles are only a mockup. Inserting the battery is a bit rough. 49 Wh are not compelling. A webcam is standard fare. SteelSeries keyboard with a unique design. 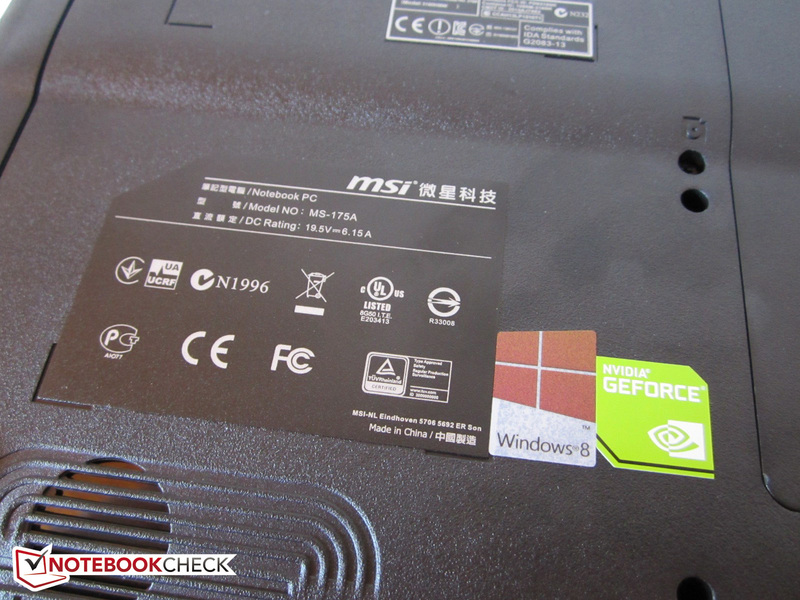 MSI installs many features in the GP70. The sound quality is neither bad nor really good. Rockin' it old school: touch-insensitive surfaces. A dedicated number pad for heavy numpad users. 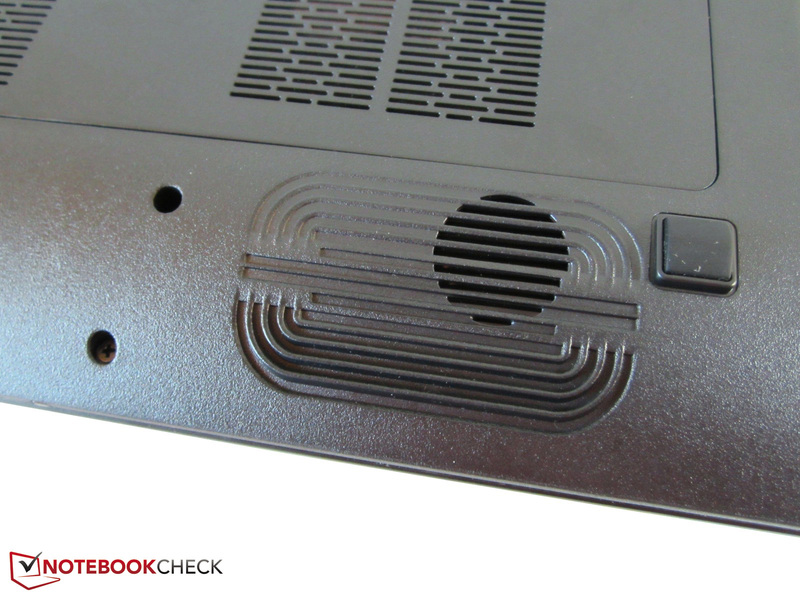 The manufacturer integrates a DVD burner. Older monitors are connected to the VGA port. USB 3.0 has become standard. The battery has 6 cells. The GP70 is maintenance friendly. A keyboard backlight would be nice. The hard drive and battery could also be stronger. 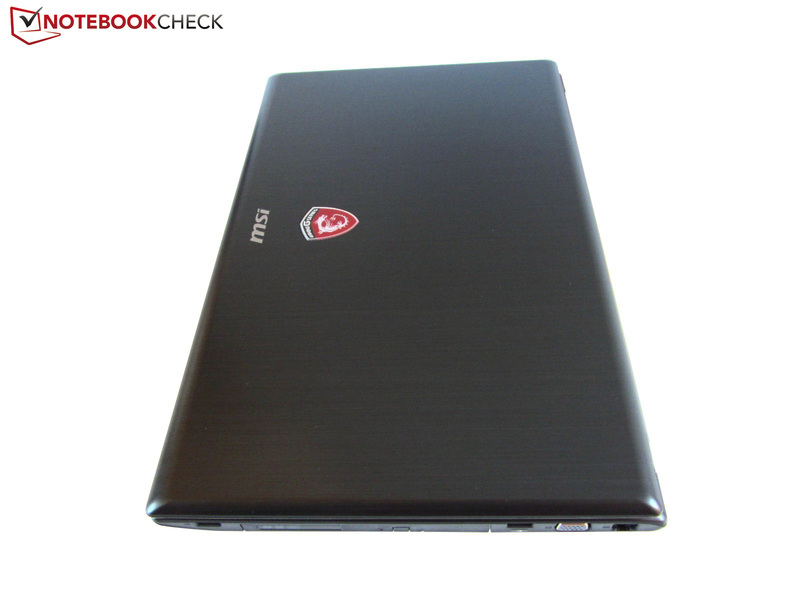 Modern design here and looks from 2000 there - MSI's artistic qualities vary greatly. 17-inch gaming laptops with a GeForce 800M that are not too bulky or heavy are: Nexoc M731, Nexoc G728II, MSI GE70 & MSI GS70.